The Oklahoma School Testing Program (OSTP), grades 3-8, has been linked with The Quantile® Framework for Mathematics. Students taking the end of grade Mathematics assessment will receive a Quantile measure on their individual student score report. Districts can also find students’ scores through reporting measures within the Measured Progress Portal. The Quantile Framework for Mathematics is a scientific approach to measuring mathematics achievement and the difficulty of mathematical skills and concepts. The Quantile Framework consists of a Quantile measure and the Quantile scale. A Quantile measure represents the difficulty of a mathematical skill, concept or application and a developing mathematician’s understanding of these mathematical skills and concepts in the areas of Geometry, Measurement, Number Sense, Numerical Operations, Algebra and Algebraic Thinking, and Data Analysis, Statistics, and Probability. Quantile measures are expressed as numeric measures followed by a “Q” (for example, 850Q), and represent a position on the Quantile scale. The Quantile Framework spans the developmental continuum from Kindergarten mathematics through the content typically taught in Algebra II, Geometry, Trigonometry, and Pre-calculus, from below 0Q (Emerging Mathematician - EM) to above 1600 Q.
Quantile measures provide a way to monitor a student’s progress towards career and college readiness as shown in Figure 2. The near upper right-hand corner are the range of mathematical demands of post-secondary pursuits, ranging from approximately 1220Q to 1440Q. 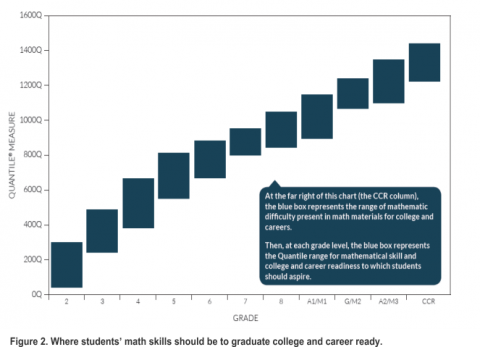 We also see the individual grade level ranges for students’ mathematical skills, again forming the pathway toward college and career readiness. Students, their parents and their teachers can use this trajectory to monitor their growth and progress over time. Students in grades 3-8 receive a Quantile measure from the Oklahoma State Testing Program (OSTP) Assessments for Math I. Click here to access a list of assessments, by assessment type, which provides student Quantile measures. The skills and concepts of The Quantile Framework are aligned to the Oklahoma Academic Standards for Math. Two free Quantile web tools, Math Skills Database and the Quantile Teacher Assistant, allow you to search the database of Quantile skills aligned to Oklahoma’s standards. Simply choose "Oklahoma" from the drop-down menu to access the alignment. Click here to learn how Quantile measures support the standards and how you can use them to help ensure college and career readiness. More than 600 textbooks and 3,100 downloadable resources have been aligned to the Quantile Framework. Math Skills Database: Search the Math Skills Database for skills and concepts aligned to your standards. The database contains targeted, free resources that appropriately match to students by Quantile measure and math content. Quantile Teacher Assistant: Use the Quantile Teacher Assistant to differentiate math instruction by matching skills and their measures to the relevant standard you are teaching. This tool has been aligned with North Carolina’s mathematics curriculum standards. Find Your Textbook: This free search tool helps educators, parents and students find targeted resources to supplement the textbook material. Users can search over 600 textbooks by title, ISBN, publisher, state edition or course. Math at Home®: Math@Home provides access to a growing number of family-friendly mathematical resources that support the textbook lessons or math topics a child is studying in school.